Pictured are I.H. Boothe, Logan Farmer, C.S. Dale, W.T. Worthington, Walter Wilcox, Letcher P. Gabbard, South Strong, W.R. Moore, Albert Stone, Leslie Anderson, Cam S. Holbrook, S.B. Chandler, Lowell E. Sharon, T.A. Christopher, John P. Strother, Arnold Webb, J.B. Campbell, T.R. Heaberlin, L.M. Upchurch, Webster Qualls, Gayle Prather, M.C. Ison, Sam B. Yaden, Carter Hamerick, Harry DeAtley. Earp, A.J., “Eastern Delegates to the Y.M.C.A. 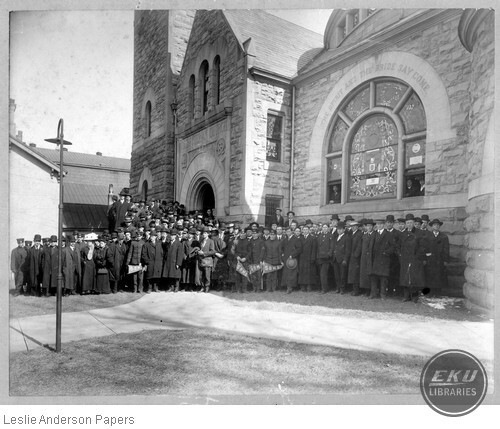 Convention in Winchester ,” Digital Collections, accessed April 22, 2019, https://digitalcollections.eku.edu/items/show/1918.